Stuart Cove's Dive Bahamas is Nassau's leading full service dive resort. Originally opened in 1978, the operation has grown to a fleet of seven dive vessels, with five of the boats over 40 feet in length. 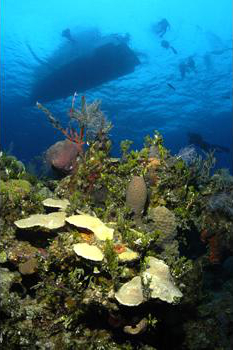 Located on the southwest side of New Providence Island, Stuart Cove's is in the ideal physical location to take advantage of the diverse underwater geological formations. As such, dive sites are available for divers with no experience all the way up to expert-level dives including four new shipwrecks we have helped place in the last two years. See the underwater creatures of the night with this incredible experience only offered by Stuart Cove's! 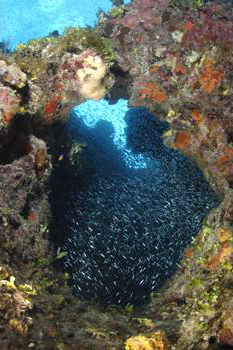 Night dives at Stuart Cove's are 1-tank boat trips which can be scheduled to go out any night of the week. The only requirement the dive shop has is that night dives must have a minimum of 6 divers for the trip to depart. Typically night dive trips visit one of our ship wrecks. We do not sell night dives in advance unless there is a group of 6 or more. Typically the dive shop is able to get a night dive out on either Friday or Saturday night. If you are interested in doing a night dive, simply let the girls at the dive check-in desk know and they will assist you selecting a night and locating additional divers. The trip departs at the captain's sole discretion. No refunds for bad weather will be issued unless Stuart Cove's cancels the excursion. Stuart Cove's reserves the right, under certain weather conditions, to omit specific portions of the program or to choose an alternate location depending on the condition of the ocean. No partial refunds will be issued for facilities not available due to rough weather, or to persons not meeting the minimum physical standards suggested for diving. Guests not meeting the specified pre-requisite for participation have no recourse against Stuart Cove's, Majestic Tours or Majestic Holidays.